Following on from my interview with Paul Navesey, below is an interview with womens champ from the South Downs Way 50 last weekend, Edwina Sutton. As a father of two young kids, I sometimes find it hard to train for the races I do. However, being a father is a million miles away from being a mother, in most households. Oh, and I am also not racing for the win. Often it can be hard to relate to the elites or give yourself excuses that you cant race as hard as them, because you don’t have the time or environment to train as they do. Edwina blows that myth out of the water and whether that’s a good or a bad thing for our ego’s, I will leave up to you. Having got to know Edwina recently, she is an incredibly inspiring individual and proves that you don’t have to compromise family life for athletic success. Like Paul, she doesn’t shout about her successes and is very down to earth. So I wanted to find out a bit more about her, her recovery from the South Downs and plans for later this year. Did the SDW50 go completely to plan or was it a battle? My plan was always to finish after dropping at Southease the year before, so in that way it did go perfectly to plan! The win and course record were icing on the cake, but I ran it to finish rather than aggressively race it. I am still very new to ultras and learning how to run well over these distances is a work in progress. I made some nutritional errors and let a group of guys pull away after Southease which left me running the last 15 miles on my own and looking back I wish I had worked a bit harder to keep with them. I concentrated a bit too much on finishing rather than pushing myself harder, but I learnt a lot and that is what I wanted to get out of the race. Like Paul, you were favourite- how was the pressure with that? I think Paul took most of the pressure away from me as most people were expecting him to deliver a fast time. A couple of days before the race I turned off twitter and facebook so I could concentrate on my own race. To be honest I am so busy with the kids and getting everything ready for them over the weekend, all I was thinking was I just cant wait to get started! Having competed in major races in triathlons I feel pretty chilled in the much friendlier and low key world of ultra running. As ultrarunning grows, the womens times are being smashed each year. 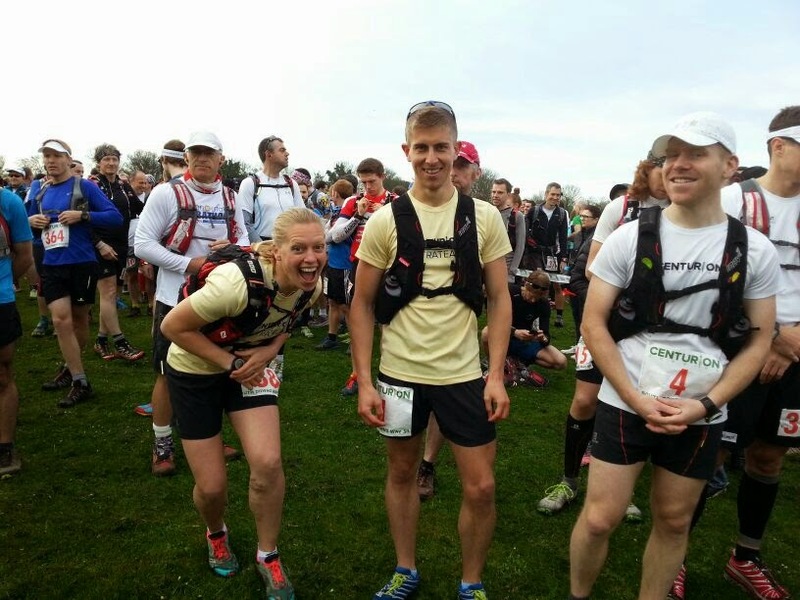 Your time would have won the mens field at the North Downs Way 50 in 2012, as an example- what do you think the reason is it is getting so much more competitive? The womens field are growing at every race which is fantastic and women are coming over from marathon and triathlon racing already with a strong endurance background. I also think those women who have been competing for a couple of years now like Sarah Perkins and Gemma Carter are seeing the results of consistent training and mentally getting stronger at holding a faster pace for longer. Do you think you will win an event overall soon? That is one of my running goals! I came very close at Salisbury 50km last year. There is nothing I like more than beating the boys. Once races go over about 35 miles I think the divide between men and women rapidly diminish. To me, anyone running is a competitor! You are doing Lakeland 50 in the summer. Do you have a plan for this yet? Of course! I am so excited about this race. I had a look at the entry list and there are some FAST girls running. Its going to be a huge effort to get in the top 3, but that is my plan at the moment. I have some weekends planned to recce the route with the Centurion team which will be fun and really useful. How did you get into ultras? I always ran at school and played lots of sports. I then went to uni and played competitive hockey for 3 years. Once I was working as a PE teacher I couldnt play sport on a Saturday anymore so I starting training for triathlons. I competed for 3 years over all the distances, but really enjoyed half and full ironman distance. After i had my first child I thought I would get back into tris. But I soon realised i was never going to be able to match the 25+ hours a week I used to knock out and I didnt really want to with a young baby to play with at home! I also had made the decision not to go back to work, so had no money for the expensive world of triathlons! However I really needed an athletic goal in my life which would scare me a little bit and make sure I got out the door everyday and out of my stretchy pants! Being a mum of two young kids, you inspire people like my wife and we have kids of similar ages. How do you fit it all in, when most people struggle to train for a half or full marathon, let alone not only an ultra but competing in an ultra? That is lovely to hear and makes me very happy. With a 1 and 3 year old at home life is a real juggling act. I have a very supportive husband which massively helps. I write a plan every week with how and when I am going to fit everything in. I run early mornings and in the evenings, often running twice a day. I have a running pram, so when I drop the 3 year old off at nursery I can get in about 6 miles with the pram before my 1 year old starts trying to climb out! I dont do huge mileage, but do 2-3 really quality sessions a week, things like 8 x 800m or 3 x 10 mins continuous hill reps. I am great advocator of quality of quantity. I do a 25+ mile run about every 3 weeks. I often say the hardest part is not the training, its the lack of recovery and sleep I really struggle with. Busy, long days and broken nights make training sometimes hard work. BUT I get so much out of training and racing I really do believe it makes me a better mum. It also is so inspirational seeing my kids wanting to run, loving their sport and being strong, active and happy kids. What was recovery like last week with two toddlers surrounding you? Bloody horrendous. I would have paid someone good money to have the kids. The evening we got back the kids were clamoring all over me as I was lying on the floor projectile vomiting. They werent in the least bothered, my 3 year old, said, ‘Mum you must have run really hard!’ My body was so exhausted the next few days, I kept forgetting the kids names and forgetting what we were meant to be doing or going! Nappy changing was very painful and I had a nasty incident getting stuck in the soft play, but I got through it with a huge amount of calories and the smug satisfaction of what I had achieved over the weekend. Do you have a dream race? Comrades or UTMB. I would love to do both, but wont until the kids are a bit older. What do you get most out of ultrarunning? I love the freedom of running, I love being out in the hills and being away from the loudness and chaotic noise of people. I love the feeling of pain and then the feeling of huge satisfaction of finishing a hard race or training session. But the best part for me right now, is it is something I do, when I am running I am not a mum, a cleaner, a cook, a bag holder, I am me in my own right. And the brilliant thing now, which I didnt have when I was a triathlete, is I get to come home to my family which is just the best feeling in the world.